A man-made pyramid charged by a Tesla Coil and photographed by a Kirlian camera. Four locations in perfect cross-quarter formation around the world are naturally manifesting the characteristics of the 4 Classical Elements of ALCHEMY. The goal of Project ALTER MaN 4 7 (AM47) is to film the journey of an alt-fuel ship that will circumnavigate the globe to connect all four of these points, one every three months over the course of a year and in so doing help raise the Awareness of mankind by generating Synchronicity through exalting The AM47 Pentaform: A psycho-cosmic pyramid crowning Gaia. The timing of the voyage is set to the ancient Egyptian/sidereal astrological year. Departing from the Point of FIRE in San Francisco, to the Point of WATER off the coast of Japan, to the Point of AIR in Turkmenistan, to the Point of EARTH in the Azores, and back to the Point of FIRE in San Francisco to complete the circle… And then advance Northward to the final Point of AETHYR. After a successfully documented and magically transformative journey* completing the ‘silver circle’ around the world, the AM47 ship is to again set sail north from San Francisco no later than 02 Oct 2012/13, etc., for Alert, Nunavut, the northernmost inhabited place on the planet near the North Pole. The space above the North Pole is the AM47 Point of Elemental AETHYR (PoEAE), and reaching Alert will begin the completion of The Pentaform: A Psycho-Cosmic Pyramid Crowning Gaia. The Pentaform is created by generating psychic energy from the experiences and Synchronicity made by traveling to each of the 4 Elemental Points and finally reaching the 5th Point of AETHYR. When our Earth and Sun align with the end of sidereal Virgo and the beginning of sidereal Libra on 17 Oct 2013/14, etc., this planet/our reality have the chance to ‘enter’ the PoEAE. The crew of Project AM47 and ‘livestreaming’ participants from around the world will then attempt to generate, observe, dedicate and send the Awareness created by the completed Pentaform through the PoEAE. Once our Awareness pervades AETHYR, we’ll have the opportunity to receive a transcendent emanation through the Gateway of Arcturus which contains the vision of the future perfect version of Planet Earth in the Age of Aquarius. The Awareness of this Emanation will spread all over the world and open the hearts and minds of all beings to work together to attain that future, some 364 years from 2012. Although funding for the journey was not secured for a 2011 attempt, the cycle begins anew each year and Project AM47 will try again for a scheduled departure by 17 Oct 2012/13, etc., from San Francisco’s FIRE to the WATER of the Japan Trench. 1. (Immemorial) The Solar Apex is the current direction that our solar system is traveling through space like a comet. The North Pole is averagely (due to Precession) pointed in the direction of the Solar Apex. In essence, the North Pole is where we are going (future) and the South Pole is where we have been (past). 3. (Ancient) In the tauroctony image of Mithrasism, the tail of the bull (Taurus) becomes the shaft of wheat (Spica & the AM47 Point of AETHYR) which aligns with the celestial longitude of and points directly to Arcturus (the gateway of The Altered Man). This “Gateway” would manifest on a mass scale on 17 Oct 2012/13, etc., provided the AM47 circumnavigatory voyage is completed. 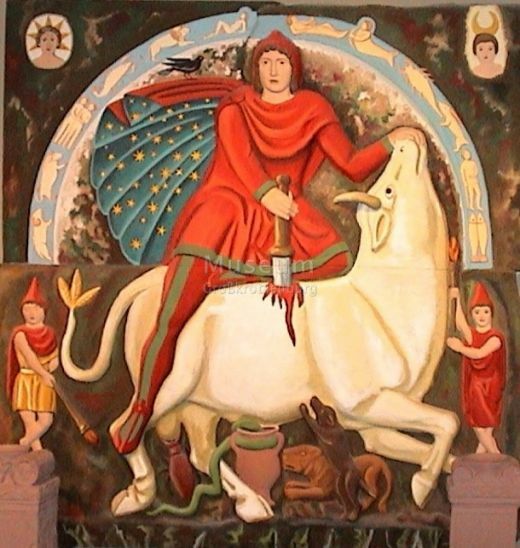 Mithras, the magician out-of-time is slaying the Age of Taurus to usher in the new Age of Aries. The Scorpion after the Bull’s testicles represents Scorpio (the opposite sign to Taurus) asserting it’s future reign in it’s Age. The image symbolically represents the phenomenon known as “the precession of the equinoxes” which is the key to true Sidereal Astrology. The AM47 Point of AETHER & The Gateway of Arcturus is shown above Mithras’ head in the gap between the tiptoes of Sidereal Virgo and the crown of Sidereal Libra. 5. 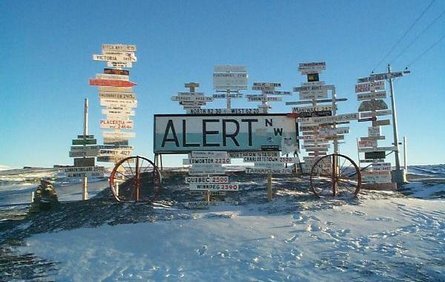 (1875) Alert, Nunavut is the northernmost permanent habitation on earth. Alert~Alter~AEthyr!!! Alert happens to be right-on the longitude directly between the Point of EARTH and the Point of FIRE! 7. (1992, 2009) I read The Prism of Lyra in 2009 and the 5th Element of AM47 clicked into place. HIGHLY recommended reading. Too much to include here right now… I’ll need to add-in later. 8. (22 May 1992 & 10 Aug 2012) The supposed discovery of a Dark Pyramid underground in Alaska, which is almost right-on the longitude of the AM47 Point of AETHYR (which lies directly between the Points of FIRE & WATER!!). 9. (2001) The North Pole Inner-Earth Expedition is a kind-of sister expedition to AM47. A voyage to the North Pole to look for an entrance to the “Hollow Earth”. 10. (12 Mar 2008) The “global superpowers” race for energy supremacy at the North Pole… But shouldn’t it be the one place that belongs to Everyone?? 11. (10 Aug 2010) Laurie Anderson gives a thumbs-up (to the Nuclear-Free Future Award ), and speaks about the process of imagining the end of the world and the steps needed in order to prevent it… while at the (magnetic) North Pole. 12. (18 Oct 2011) The group M83’s music hit “Midnight City”… M83 is a spiral galaxy just below the Point of AETHYR!!! 13. (05 May 2012) NPIEE gets the greenlight! A major documentary film producer has agreed to fund their “Inner Earth/Hollow Earth” expedition! The charter deposit is about to be submitted to the Russian charter company. After six years of hard work and faithful support, the Expedition is ready to depart in July-August of 2013. This gives me a glimmer of hope that one day AM47 will get funded as well! Though AM47’s premise is more nebulous, the evidence is evermore compelling nonetheless! It just hit me that NPIEE is going Below, and AM47 is going Above! As Above, So Below~As Without, So Within. AM47 and NPIEE truly are sibling projects… We need to borrow their ship to make it to the Point of AETHYR. From the PoEW, the PoEAE dead middle, to the PoEF!!! 15. (20 May 2012) “Torsion Fields (albeit still pseudoscience at this point)” are an intriguing “AEthyric” mechanism by which (sidereal) Astrology may operate to influence persons, places and things in general. On Sunday, May 20, 2012, the first annular solar eclipse visible in the continental United States for 18 years crossed the entire Pacific Ocean. Richard C. Hoagland, certifiable Mars fanatic perhaps, performed a very interesting experiment during the eclipse that I would like to see replicated again please… Inconclusive yes, yet something in this does resonate… needs work. 16. (11 Sep 2012) AETHYR is the structure of creation.?. The Higgs-Boson particle/field as a torsion back into AEthyr? The Higgs-Boson “God Particle” was theorized 47 years ago, and found today, 11 Sep 2012 ;) …needs work. 17. (12 Sep 2012) The Aurora Borealis as seen near Alert, Nunavut, Canada. 21. (17 Oct 2012) The Sidereal Astrological chart at/on the 2012 AM47 Point of Elemental AETHYR: No greater cruelty than the dream withdrawn. Saturn, the grand malefic, has been applying to the Point of AETHYR (@ Zero degrees Sidereal Libra) these past few years… No wonder that project AM47, even at this critical time, could Never have been made a reality. This year would be the first real chance AM47 really ever had, with Saturn finally being just out of the orb of influence to the AM47 Point of AETHYR… Why… Was it always too late.?. 22. (17 Oct 2012) No greater cruelty than the dream withdrawn.?. And touch HERE to discover practical ways that YOU can help alter man NOW. This entry was posted on 7 October 2012 at 06:04 and is filed under 47, Alchemy, Alternative Energy, Astrology, Atlantis, Burning Man Event, Burning Man Project, Cetaceans, Classical Elements, Destiny, Dream, Fundraising, Jack Fool, Magic, Metafiction, Metaphysics, Mystical, Mythology, Occult, Ocean, Point of AETHER, Point of AIR, Point of EARTH, Point of FIRE, Point of WATER, Prophecy, Sacred Geometry, Ships, Sidereal Astrology, Synchronicity, Uncategorized with tags Alchemy, astrology, destiny, Magic, magick, mataphysics, Occult, sacred geometry, sidereal astrology, Synchronicity. You can follow any responses to this entry through the RSS 2.0 feed. You can leave a response, or trackback from your own site.